Approved test to measure the envelope tightness for both new and existing construction. This test measures the air changes per hour of the building envelope. Meet us at the jobsite while we are testing and we will do a walk-thru and find your leaks before recording any results. As of January 1, 2011 Georgia adopted the 2009 International Energy Conservation Code with Georgia Supplements and Amendments. 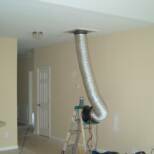 As part of this code change, Duct and Envelope testing is now requred for all new construction permitted on or after July 1, 2011. Give us a call for more information and to schedule an inspection. As part of this inspection, we will set up the equipment and perform a walk-thru to help locate any air leaks and allow them to be corrected before recording test results. There are currently three tests approved to measure duct leakage. 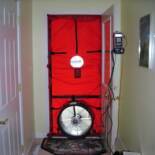 HVAC systems are required to pass at least one of the three tests.